Today, I believe, is the first day of a several-week building period, at the end of which I will explode. Not that it’s a bad thing, it’s just going to be very busy with the play and all, and I’ll have to buckle down and be diligent with my work and painting. Working a road show today. I love doing this, perhaps it’s just me, but waking up at 7 in the morning to load in a show is good times for me. Depleting my body of all of its energy stores in order to construct a set which will only be torn down at the end of the night is somehow pleasant to me. I love working them, though, partially because the people are always good to work with. They’re always friendly and patient, because if it’s your job to load in a show every day with a different group of people which you have to explain what to do over and over and over again, you have to be patient and friendly by default. They always end up being slightly loopy, too, which is just more fun. Working on electrics is my favorite, and believe it or not, I haven’t had to use my crescent wrench *once* today. Well, off to be studious, and rest up for load out tonight. A family portrait, as Choppi crushes my face. Extended family portrait, with Uncle Brendan and Auntie Squirt. I’ve figured it out! After some careful insights, I’ve discovered why there’s so much drama going on this year than past years. Because this year I’m hanging out with frickin DRAMA people! DUUUUUUUUUUHH!! I mean last year, who did I hang out with? Chemists and physicists. Drama there? Nooooo. Freshman year? I hung out with political sorts. Drama there, but a different sort of drama than Drama drama, which is dramatic in an entirely different way. Anyway, here’s a comic series I’m keeping for myself, containing my biting social commentary about my social circle(which is about as biting as a toothless bunny). Commentary or no, we all make damn cute kittens. she makes little hamster gloves. Oh Wheeeeeeeeere is my Hairbrush? I have misplaced my hairbrush, and thus have not brushed my hair in three days. Things are getting out of control. In other news, today there was a large, inflato-bouncy slide erected on the lawn in front of our dining hall. It was significantly large, inflated, and bouncy (not to mention great fun). I think more colleges need large, inflato-bouncy slides on campus. If there were a permanent inflato-bouncy slide on campus, I believe student morale would skyrocket. No word yet on the reason behind the presence of the structure, but who needs a reason! Too bad it was just for today. I whine a lot about how I’ve never been West, and how I’d like to go out there hiking and camping and seeing the sights and whatnot. However, I recently decided that I have no right to whine, because there are plenty of cool places in Kentucky that I’ve never visited. 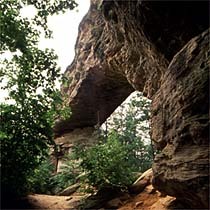 Today, Jen and I drove out to Natural Bridge to do some hiking. It was a lovely day for it, cool and overcast, and the rain held off save a mild drizzle at the end of the day. The forest was gorgeous, there were many different ferns and mosses about, and I felt like a dinosaur, hehe. The bridge itself was very neat, and we listened to a lady give a schpeel about how it was weathered and wind eroded. Very interesting. I took a few photos, but as I am impatient, I’ll provide a few I found on the net. There were many other equally fascinating rock formations, with incredible slopes and patterns due to erosion. Jen commented how interesting it was the formations seemed the result of some violent action, when in fact it had taken a few bizillion years to create them. We pondered going to Red River Gorge afterwards, but were pretty tired, so decided to save that for another day (the area is surprisingly close to my college). Next adventure we’ll probably go to Mammoth Cave. Seeing all those rock formations reminded me of how much I love caves, and how long it’s been since I’ve been in one. My dad was late picking me up to go home for fall break. He was held up by a terrible accident, an SUV toppled and completely flattened, the firemen scrambling to get the survivors out. “How horrible!” I thought idley, as one does. “Oh..there’s a dead person right there..” I stammered before I realized how silly that sounded, my eyes locked on the site as we rolled past. Logic had tried hopelessly at first,ah, it’s just someone sitting there, because you don’t see dead bodies, you just don’t. But it was fleeting, as my eyes floated on the corpse with a puzzled sort of strain, the same sort of gaze the police and ambulance crew had as they stood there, one of them taking photos. It could’ve very well been an old man fallen asleep in an easy chair, his head lulled back in a gruesome sort of snore, except for the more graphic parts, I suppose. They had to cut away the entire car to get to him, so he was sprawled there in the seat with a ravaged carcass of metal twisted behind him. “Someone won’t be coming home from work tonight,” my dad sighed solemnly. “Mmm.” I agreed, unable to rip my eyes from the dead man until we were well out of range. I turned back with a shudder, my mind full and numb. I still have that icy chill in the pit of my stomach. Such is mortality and the things we take for granted. Falling for the first time..
I’m sitting down in the basement of Olin, 30 minutes before Comp Sci lab starts, mulling about how bad I feel for dashing out of that Calculus test so early. I know how it feels to be right in the middle of a fairly difficult test, working away, when someone gets up and turns theirs in. Panic! I must be doing something wrong! I’ll never finish in time! AHHH!!! I have no desire to make anyone feel like that. So when I finish a test early I sit and wait and kick my legs, and do some checking (which is a good way to stifle my impatience and catch those ridiculous mistakes I make). Generally, I wait for someone else to turn in their test first, because turning in a test second isn’t so bad ^_^ But I am terribly fidgety and impatient, so up and off I went. ..but I didn’t want to talk about that today. I want to talk about autumn. I like it, it’s my favorite season, and I think I’ve figured out why I appreciate it so much. Autumn is very sneaky and fleeting around here, so when you catch it, you appreciate it all the more. I don’t know if it’s the small region or the whole state, but weather here is a jumble of extremes. Sure, if you take the average all year, it *looks* like we have all four seasons. But really, the “fall” season consists of these days…Summer, summer, summer, winter, summer summer, winter, summer, winter winter winter, summer winter, fall, winter winter winter. It’s bounce back and forth, and if one day happens to land on fall, it’s rather lucky. Sometimes it’s not even an entire day. It’ll be winter in the morning, then walking to lunch you pause and look about and sniff and notice that it’s autumn. Later that afternoon, it may turn to summer again, then bounce back and forth until it’s winter at night. Sometimes there are patches of night time which are autumn, and I find those particularly pleasant. One day you may look up and notice all the leaves have changed, then the next day they’ve all fallen. Sneaky sneaky autumn, makes it all the more precious.